In this 2012 file photo, Dr. Leana Wen stood in the emergency department at Brigham and Women's Hospital in Boston, during her medical residency. In 2018, she became president of Planned Parenthood. 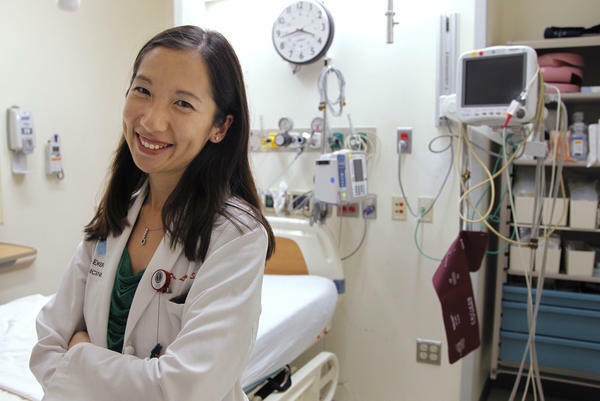 Dr. Leana Wen is no stranger to working under pressure. As an emergency physician, she was charged with making life-or-death decisions about her patients' health. Now, as president of Planned Parenthood, she's at the helm of one of the nation's most polarizing health care and advocacy groups. Wen's the first physician to lead Planned Parenthood in nearly 50 years. During a recent visit to North Texas, she said providing care to those who need it shouldn't be political. "For the nearly 2.4 million patients who walk through the doors of Planned Parenthood every year, they're not making a political statement," she says. "They're trying to get health care. They're trying to get their breast and cervical cancer screenings, their STI/HIV test, birth control, the full range of reproductive health care. For so many of the patients that we serve, we are their only source of health care." Wen took over as president of Planned Parenthood last November. She replaces Cecile Richards, the daughter of former Texas Gov. Ann Richards. Previously, she was Baltimore City Health Commissioner, where her work sometimes pitted her against the Trump administration. Under Wen's leadership, Baltimore successfully sued the federal government for cutting funding for teen pregnancy prevention. Now, Wen is turning her attention to sweeping changes aimed at family-planning programs. Last month, the Trump administration proposed new regulations for Title X. The federal program provides reproductive health care to about 4 million low-income patients. These changes would block funding for providers that offer abortions, or refer patients for abortions. "To me, as a physician, this is unethical and unconscionable," Wen says. "It is direct interference with the practice of medicine. It's what happens when politicians tell doctors what it is that we can say to our patients, and I worry about what this will do to patient rights." She says those changes would force Planned Parenthood to refuse funding from the Title X program. Wen worries about the potential impact on low-income patients who rely on the group's clinics. "We know what happens when people are prevented from going to their provider of choice," Wen says. "They delay care, or they simply go without, and we've seen what happens right here in Texas. When politicians forced health centers to close, more than 30,000 women went without access to healthcare. That's what's at stake. It's about people's lives and our health." In 2013, Texas launched a state-run Women's Health Program, which is now called Healthy Texas Women. Lawmakers had blocked taxpayer dollars from going to abortion providers, which meant groups like Planned Parenthood were effectively excluded. According to the state's Health and Human Services Commission, the program served about 30,000 fewer women that year than the state did in 2011. "There's so many examples around the country and here in Texas that directly go against public health best practice, that go against what we know in medicine to be true," Wen says. "This is a dangerous trend." Wen understands just how important access to reproductive health care can be. Her family came to the U.S. from China when she was 7 years old. "My parents worked two or three jobs each, and we still struggled," she says. "We depended on Medicaid, and we depended on Planned Parenthood. ... I was a patient of Planned Parenthood. My sister was a patient of Planned Parenthood, just like one in five women in America, and for that, I will always be grateful." Now, she wants to pay it forward.